"God's Provision and Leading in Our Story." But, that was too long to fit up there on the menu! 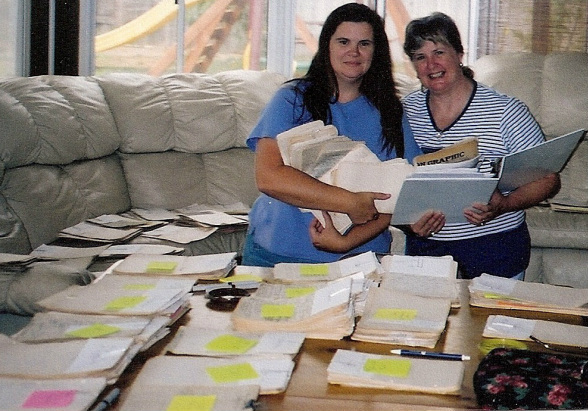 Here we are sorting the tens of thousands of pages of original manuscript. We still didn't really understand the scope of the job ahead! Have you ever helped an elderly person move from the home they have lived in for decades? All sorts of treasures are discovered in the process! But we think the treasure we found, way back in the autumn of 2000, was more than just a unique find. We believe it was a spiritual legacy, beautiful evidence of a passionate love for God, and the change one man can make in God's kingdom, when he is sold out for Jesus and willing to go to any lengths to tell of Christ's love for mankind. We were finishing up, really. The garage had been cleared. Our mother was having to move from her home of nearly 50 years, and this was a big step. Yet just as we were leaving, we noticed a big box, pushed way back in corner of the attic rafters. We had missed something - what could this be? Honestly? Cara figured it was another box of memorabilia, saved by our gentle-hearted mama. But as we untied the rope and lifted the flaps on the large, dusty cardboard box, the treasure that was revealed was startling. There, protected for at least 40 years by layers of butcher paper and tightly bound cords, lay hundreds of ivory packets of paper with fountain pen scrawls. Each packet was tied carefully with string. The handwriting was unmistakably our Papa's. We knew immediately that these were the teachings, sermon notes, and collected writings of our grandfather - Papa - the Rev. Lawrence A. Meade, an internationally known evangelist and pastor. We had no idea these writings existed. But, as soon as they were revealed, we knew they were a stewardship for us to share with many. That day began a ten year journey to the publication of Classic Christianity: A Year of Timeless Devotions. It is our prayer that these daily devotions will draw you closer to God, and help you discover the joy of a journey with Him.